UT Market, a subsystem of the Financial Resource Management System (FRMS), is an electronic procurement system that enables shoppers to browse for products across multiple suppliers, select items for purchase by placing them into a virtual shopping cart, and assign the cart to an authorized departmental buyer. Buyers make the decision to check carts out of UT Market and turn them into requisitions in FRMS Procurement. Final approved requisitions are then electronically dispatched to suppliers as purchase orders. 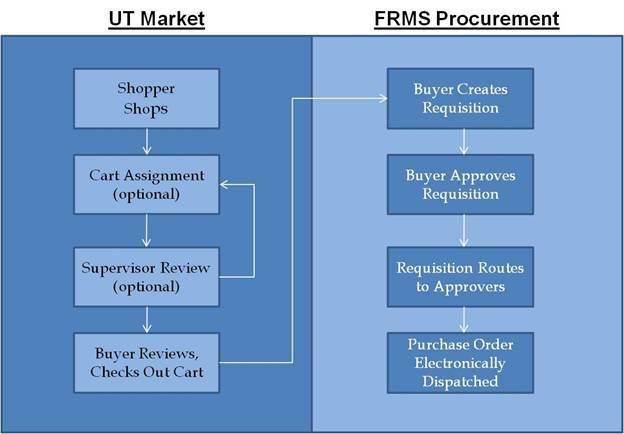 Authorized departmental shoppers and buyers enter UT Market from the eCommerce tab in FRMS:https://utdirect.utexas.edu/apps/frms/utmarket/ecommerce/. Interactions with suppliers are electronic. This eliminates the need to call, e-mail, or fax suppliers to get quotes, or to inform them of approved purchase orders. When purchase orders are electronically received, suppliers immediately begin processing orders for shipment. This greatly reduces the amount of time it takes a supplier to fill an order. Because details about items to be ordered are received directly from the supplier, less data entry is required on UT Market requisitions. Items are still shipped to either Central Receiving or directly to the department. Regardless of where items are delivered, all invoices and payments for UT Market orders will be processed by Accounts Payable in the Office of Accounting. Buyers are users who are authorized to create electronic requisition documents in FRMS Procurement. Buyers are authorized to check out carts in UT Market and turn them into electronic requisition documents in FRMS Procurement. Shoppers are users who can browse product catalogs in UT Market but do not have authorizations to create electronic requisition documents. They can create and put items into carts, but those carts must be routed to a departmental buyer in order for them to become requisitions. A user can either be a buyer or shopper but cannot be both. Each department must determine how UT Market carts will be routed before they are assigned to the departmental buyer. For example, a department may choose to have staff members create and put items into a cart, then assign the cart to a supervisor for review. The supervisor can review or edit the shopping cart and then assign it to the department's buyer. The buyer would then check out the cart from UT Market and turn it into an electronic requisition document. Contact a department’s buyer for more information about that department’s procurement procedures. In order to use UT Market, department users are required to attend training and be authorized by the Purchasing Office. Departmental buyers can e-mail askUS@austin.utexas.edu to express interest in receiving training. Users who have been authorized by the Purchasing Office will have one of two roles in UT Market, buyer or shopper. Buyers are users who are authorized to check out carts in UT Market and turn them into electronic requisition documents in FRMS Procurement. A user is given the buyer role in UT Market if the user is on a desk that has Update (U) or Super (S) command authorization for the PBU command in Electronic Office Management (EOM). Shoppers are users who can browse product catalogs in UT Market but do not have authorizations to create electronic requisition documents. Anyone who has been authorized by the Purchasing Office for UT Market, but who is not a departmental buyer, will be given the shopper role. Draft requisitions are orders that have been checked out of UT Market and transferred to FRMS by a departmental buyer. If items from more than one supplier are placed in a single cart, the cart checkout process will create one draft requisition per supplier. The buyer will then create official requisition documents from the draft requisitions. When requisitions are final approved, purchase orders are electronically dispatched to the suppliers. Departments should not call, e-mail, or fax UT Market purchase orders to suppliers as these actions will create duplicate orders. Departmental buyers who have Update (U) or Super (S) command authorization for PBU in Electronic Office Management (EOM)can use the UT Market Cart Search and the UT Market Cart Details subtabs under the FRMS eCommerce tab to find existing draft requisitions and create official requisitions. The UT Market Cart Search page is used to find carts that departmental buyers have checked out of UT Market. By default, the page lists carts that the current user has checked out of UT Market in the past 30 days. To see a cart checked out by another user, type the user's UT EID in the Checked out by (EID) field and click the List Carts button. To limit the cart search to a particular date range, type the desired dates in the From (MM/DD/YYYY) and To (MM/DD/YYYY) fields. To view or create requisitions related to a particular cart, click a Cart ID number. The UT Market Cart Details page will appear with more information about that cart. UT EIDs that appear under the Shopper column are linked to contact information in the University Directory for that shopper. The UT Market Cart Details page lists draft requisitions and requisition documents related to a UT Market cart. When departmental buyers check carts out of UT Market, they will be brought to this page where they can create requisition documents from draft requisitions. Since UT Market allows a user to include items from several suppliers in a single cart, the UT Market Cart Details page may list several draft requisitions, one per supplier. Department buyers will create separate requisition documents, one per draft requisition, from this page. Before purchase orders are dispatched to suppliers, departmental buyers must create requisition documents from the UT Market shopping carts that have been checked out. Those requisitions must be routed through approvals as with other requisition documents in POINT Plus. When a requisition is final approved, a purchase order is electronically dispatched to the supplier. The Requisitions section lists the suppliers included in the checked out cart. Departmental buyers create one requisition document per supplier in this section. The status message at the top of this section indicates how many requisition documents have been created. The General Information section allows buyers to provide general information to be used when the requisition document is created. The Summaryfield briefly describes the created requisition document. It defaults to the name of the UT Market cart, but can be changed to any value by the buyer. The summary can be changed within the requisition document after it has been created. The buyer must select a desk on which to create the requisition document. The Creator Desk drop-down menu lists all available desks that the buyer can use. The selected desk determines the routing path that the requisition document will follow. Once the document has been created, this desk selection cannot be changed. The value shown next to Fiscal Year indicates the fiscal year in which the requisition document will be created. Once the document has been created, the fiscal year cannot be changed. The Dept Req Number field displays a department requisition number that is a departmentally assigned value. It must be unique across all requisitions created for the purchasing center. There are no restrictions on the type of characters used in this field. Once the requisition document has been created, the departmental requisition number cannot be changed. The Purchasing Center field displays the purchasing center that will associate the requisition document with an electronic office. The lookup button lists purchasing centers available to the current user. Once the document has been created, the purchasing center cannot be changed. Visit askUS to find frequently asked questions. Contact the Controller’s Office User Services team at askUS@austin.utexas.edu. To speak with a User Services team member call 471-8802. Help line hours are 9 a.m. to noon and 1 p.m. to 4 p.m. Monday through Friday. At other times of the day, please leave a message. Calls received in the morning will be returned the same day; calls received in the afternoon may not be returned until the following business day, depending on the time the message was received. For questions related to purchasing policies and procedures, contact purchasing-questions@utlists.utexas.edu.